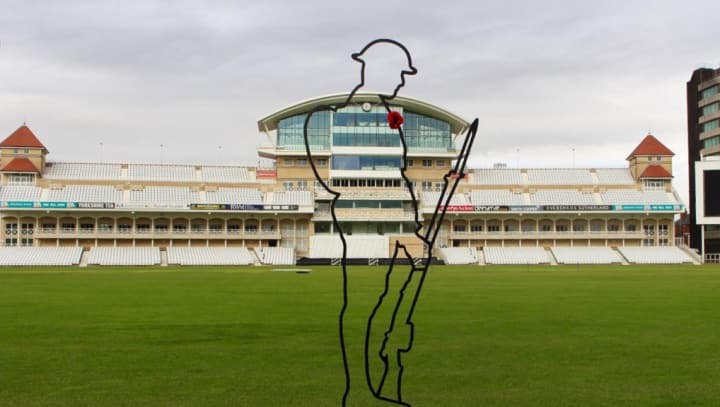 To commemorate the centenary of Armistice Day on Sunday 11 November, Nottinghamshire – together with their fellow first-class counties and the ECB – are remembering the cricketers who fought in the First World War. An event called 'Remembering the Great War’ was held in early October in the Trent Bridge Pavilion. It included exhibitions and talks from the Royal British Legion, the Western Front Association, West Bridgford & District Local History Society and the Nottingham Great War Study Group. Meanwhile, in early September, Nottinghamshire unveiled a memorial for the six members of the club who died during the First World War to mark the centenary of the end of the conflict. To support the campaign, we are inviting people to share their own stories of the contribution cricketers made to the First World War using the hashtag #CricketRemembers. “As someone who had four ancestors fight in the Great War, two of whom never returned, and someone who has an enduring love for cricket, this project is very close to my heart,” said Frith. With their captain, A.O.Jones, mortally ill with tuberculosis, Nottinghamshire had a poor season, finishing tenth in the 1914 table. Their August Bank Holiday match at The Oval left an unpleasant taste after Jack Hobbs (226) led Surrey to a big total and George Gunn and the diminutive Joe Hardstaff resisted obstinately in reply. The pavilion at Trent Bridge and the ladies’ pavilion too were turned into military hospitals. Almost mockingly it was reported that the turf across the cricket ground itself had never looked better. The occasional military and charity match was played there. As the end of the conflict neared, Notts cricket stood in a state of uncertainty. Would the finances stand up? Could a strong county XI be raised? All would be revealed. Nottinghamshire were to finish third in the 1919 County Championship of two-day matches, six of their seven home matches being unfinished. So was the match against the strong Australian Imperial Forces team which toured the land, several of its players being current or future Test cricketers. As for the future, the tough ex-soldier Arthur Carr was now Notts’ skipper. Ralph Eustace Hemingway born Sutton, Cheshire, December 15, 1877; died Hohenzollern, France, October 15, 1915. 2nd Lieutenant 8th Sherwood Foresters. Educated Rugby. Nottinghamshire 30 matches 1903-05: 976 first-class runs at 20.33 in 32 first-class matches; HS 85 (Notts v South Africans); 17 catches; no wicket for 6. Brother of two Hemingways who played for Gloucestershire. Eminent rugby footballer. Alexander Basil Crawford born Coleshill, Warwickshire, May 24, 1891; died Laventie, France, May 10, 1916. Captain West Yorkshire Regiment. Educated Oundle. Nottinghamshire 11 matches 1912 (also played 7 matches for Warwickshire 1911): total 381 runs in 18 matches at 16.56; HS 51; 5 catches; 21 wickets at 28.90. William Riley born Newstead Colliery, August 11, 1888; died Coxyde, Belgium, August 9, 1917. Gunner. Nottinghamshire 80 matches 1909-14: 740 runs at 8.60; HS 48; 69 catches; 235 wickets at 23.39, best 7 for 80. Scored 10 not out (19 balls) in 10th-wicket stand of 152 in 40 minutes with Ted Alletson (189) against Sussex at Hove in 1911. In two club matches for Oldfield Uttoxeter in 1914 he took 19 of the 20 wickets. Charles Pepper born Youghal, County Cork, Ireland, June 6, 1875; died La Clytte, Belgium, September 13, 1917. Sergeant 16 Battalion Sherwood Foresters. Nottinghamshire 7 matches 1900-01: 162 runs at 18.00; HS 40 not out; 2 catches; 3 wickets at 24: best 3 for 23; Bedfordshire 1903. Harvey Staunton born Staunton Hall, Notts, November 21, 1870; died Arzizieh, Mesopotamia, January 14, 1918. Chaplain to the Forces. Nottinghamshire 16 matches 1903-05: 456 runs at 19.00; 0 wicket for 48; 8 catches; Bedfordshire cricket; Cambridge rugby blue. Harold Augustus Hodges born Mansfield Workhouse, January 22, 1886; died Mesnil, France, March 22, 1918. Captain Monmouth Regiment attached to South Lancashire Regiment. Twice mentioned in despatches. Educated Sedbergh. Nottinghamshire 3 matches 1911-12: 141 runs at 47.00, HS 62; 1 catch. Master at Tonbridge. England rugby footballer. Involved in several courageous episodes: had shrapnel lodged in his body. Five of his brothers served in France.